How do I line up two videos? Hello, ShotCut newbie here so please be gentle! I have two videos, both of the same event, but taken with two different cameras. I want to put one as an inset on top of the other. However, in order to make this look right, I need to synchronise them, so there isn’t a lag between them. I tried doing this by dragging one of them left or right, but this is very hit and miss, and due to the grid snapping (which I assume can be turned off, although I haven’t found out how yet) is quite painful. Is there a simple way to line up the two videos so they display the same action at the same time? You probably need to have snapping on. If you don’t have it on you can’t line up the videos with the play head easily. Snapping is what let’s you align videos, images, and audio. Grid snapping is different from snapping. 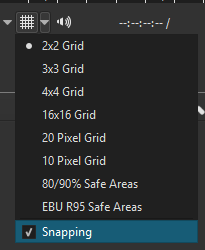 The grid snap option can be turned on or off here. Thanks to both of you, it was the snapping that was the problem. Still a pain to line them up, but at least now I have fine control! Is it possible to use a clapperboard or handclap in future? @st599 I did a handclap, but the problem was aligning the two videos. It would be good if there was a way to nudge videos backwards and forwards, rather than having to drag them, which is a bit hit and miss, but with the snapping off it is definitely easier. Excellent tip, thanks very much. Good to hear that nudging is coming soon. Any ETA? Use the scroll wheel while hovering over the playhead numerical field, with snapping enabled, just drag to the new location. I know it’s not exactly what you’re looking for, but it may help out of few others reading. Hey, that’s a great idea! I was using the numerical field, but was clicking the up and down arrows to move one frame at a time. Using the mouse is a great tip. However, I never thought of then using the snapping to line up the clips. As it happens, I wasn’t lining up to the start of a video, but given that my handclap was only there to sync the videos, I could easily cut the video to start at that point. Thanks again, this is a great tip!